Kilim (sometimes referred to as Gelim or Kelim) rugs are a type of flat-woven rug that is lighter than typical ‘pile’ rugs. The unique method for creating Kilims, which results in distinct ‘slits’ at the vertical points where colours meet, results in supremely sharp patterns, boldly geometric designs and smooth weaves. This makes Kilims excellent wall-hangings and showpieces because of their lightness and visual similarity to tapestries. Kilims have become highly collectable in recent years, and their accessibility makes them great for first-timers. Those who weave Kilims are highly regarded as artists in their villages, and the items themselves are culturally important in daily life. Consequently, many are fashioned into bags, coverings and saddles. They are not usually woven solely for export, and are still created using village-specific patterns, which gives them a true sense of authenticity. At West End Co., we do our best to honour the traditions behind these pieces, and we want to find our Kilims owners that do too. 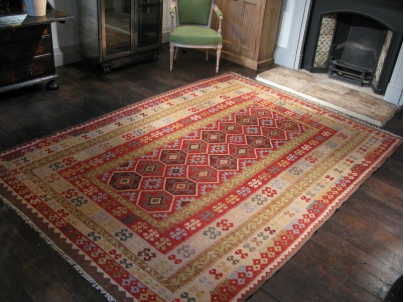 You can view our range of kilim rugs here, in our online rugs store, or from our Brisbane rugs showroom.